Goretorium made it’s debut to the world on September 27, 2012 and we were there to capture every moment of the black carpet. 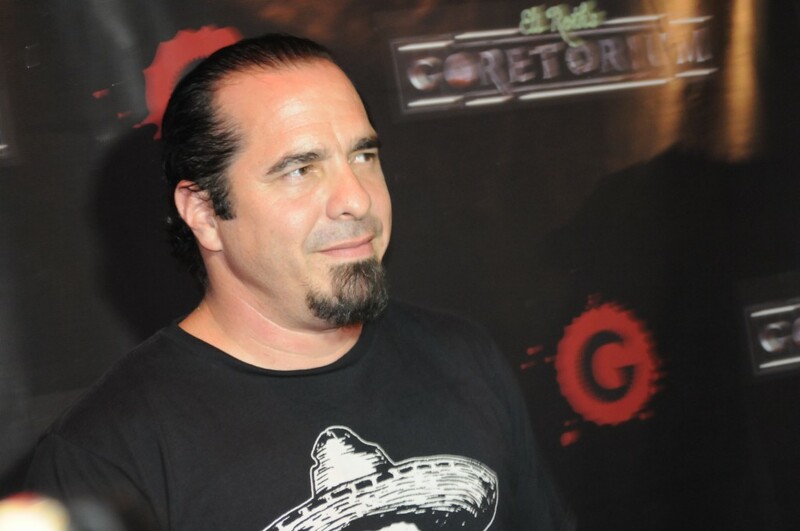 Lots of celebs were in attendance trying to gain the official first look at the “Disneyland of Horror” including the main man himself, creator, director, and all around demented mind,Eli Roth. Inside the main lobby guests walked the Black Carpet, and celebs would strut their stuff, meeting with the press, and conducting interviews. Later, we would join the other lambs, and take part in the slaughter as Las Vegas’s only year round haunted experience opened it’s doors to the public. And of course the man of the hour, Eli Roth himself with some very lovely company. For more celebs be sure to check out our footage from the black carpet below. We were able to catch up with Eli Roth himself to chat quickly about the grand opening, and some of the fun stuff guests can expect to see. While it’s not really a “ghost story” or has much to do with the Paranormal, the Travel Channel’s Zak Bagans was on hand. If there’s one person who knows scary, it’s this guy. Now onto the fun stuff. 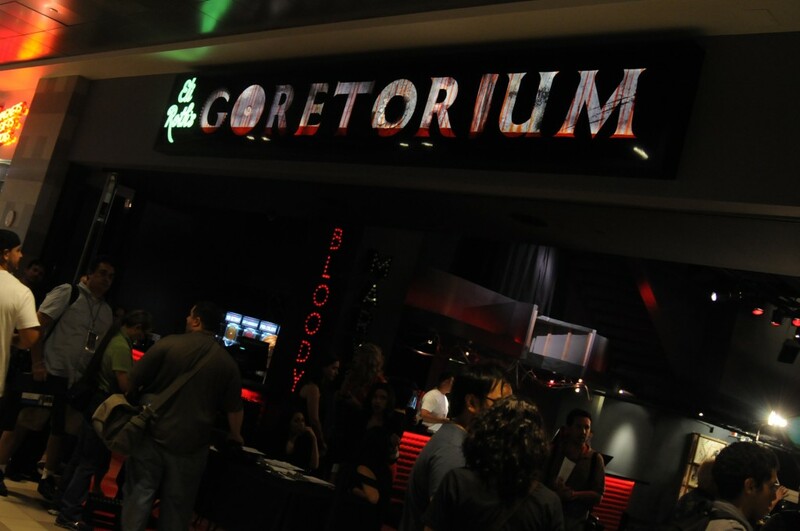 The Goretorium itself is located right on the Vegas strip directly across from The Cosmopolitan Hotel and City Center. Prime real estate for the ultimate horror experience. The view you get from the upper-terrace is nearly unmatched. The main entrance is actually located inside the mall it’s attached to, but you can’t miss it once inside. There is no real facade, it’s just a large open space. Once your in though you are engulfed in the horror, and there’s no escape. A dazzling chandelier is contrasted by images of mangled faces and bright neon signs, creating a very unique feeling of glamour and impending doom. 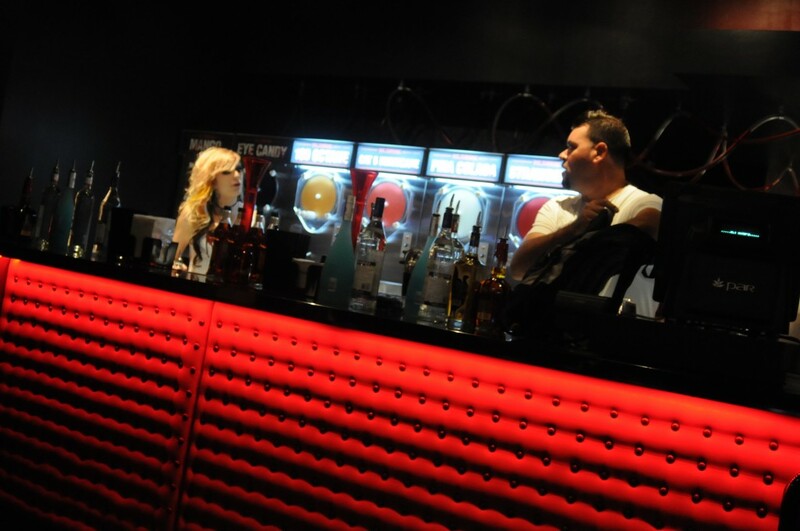 Bloody Mary’s is a quick service bar located right at the entrance, guests visiting the mall can stop by for one of Mary’s famous drinks, no mirrors required. 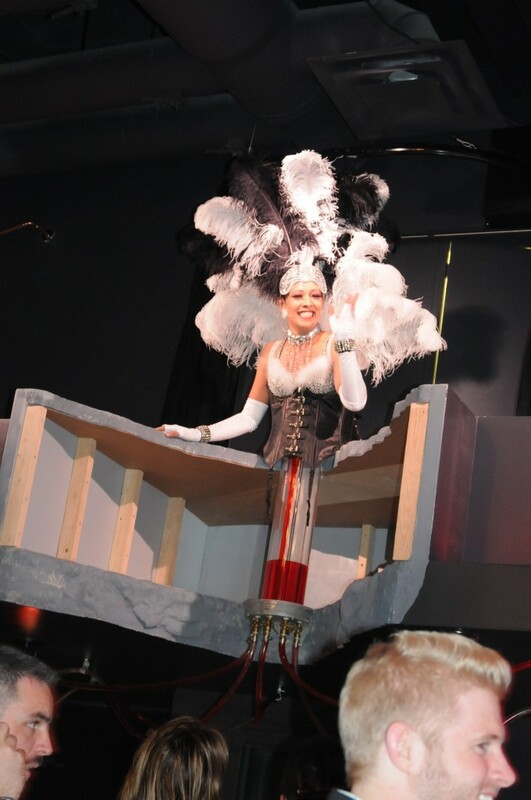 Bloody Mary herself makes occasional appearances inside the Goretorium, showcasing the secret ingredients in each of her drinks. Mary isn’t your run of the mill bartender, but a very creative special effect. Mary does not have a lower torso, but underneath her is a tube that drips with blood which then divides itself into a series of smaller tubes each leading into a separate part of the bar. It’s quite a disturbing but fun effect and Mary’s presence does add some entertainment value while guests are waiting in line for the attraction. It’s gross, but tons of fun! The main lobby is hauntingly beautiful, but surprisingly free from gore. In fact it’s probably the one place that you won’t find blood, body parts or mangled faces in the whole place. The gift shop, however, offers more than a fair share. There are some very disturbing pieces of artwork inside the shop that could very easily offend some people… it’s pretty damn fantastic! Body parts, mutilated faces, heads, pretty much any form or torture can be found inside of this small room, the definite influence from Eli Roth’s Hostel films being felt. The merchandise itself is pretty basic at the moment. Shirts, Hats, anything you would expect to find in the gift shop you encounter. Typical employee uniforms include black, with blood splattered aprons. There is blood being shed by all these helpless tourists, and you really have to watch that you don’t get any on you…bloodstains are really hell to get out, and tend to be incriminating evidence. Now on to the really fun stuff-the attraction itself. Before continuing I must warn you that there will be SOME spoilers ahead but I won’t give away the whole attraction. Also, media was not permitted to film or photograph the attraction, so bare with me on this description of some scenes and review. Besides, you don’t want everything spoiled for you, do you? Before you check out the review, check out more pictures from the red carpet! The attraction starts off in a room just above the main lobby of the Goretorium, a fairly small room used to begin the theme of the maze itself which is of an old 1950’s Vegas casino called The Delmont Hotel. In this room you’ll find pictures of past guests, a wardrobe rack with your typical Vegas showgirl wear hung across it, and some gorgeous lighting fixtures hung overhead and seen throughout. Nothing really happens in this room. You then move up a small flight of stairs into what is an elevator hub. Some shafts are open, others are closed but it’s insanely detailed and they placed a really good scare in this room, won’t tell you what happens but stay clear of elevator 1. A bellhop/elevator service man begins to tell the story of The Delmont and it’s past owners and how they both committed suicide. He is interrupted by a teen taking pictures of the room, he asks the teenager to stop taking pictures of the room. A large elevator door opens and you load in. The bellhop then tells you where you are going to take your tour and is interrupted again by teen snapping pictures with his cell phone. He then grabs the teen, pulls him out of the elevator, the elevator doors close, and the shadow of the teen getting massacred through an elevator window can be seen. You begin to move upward on the elevator and you suddenly stop with a huge thump. 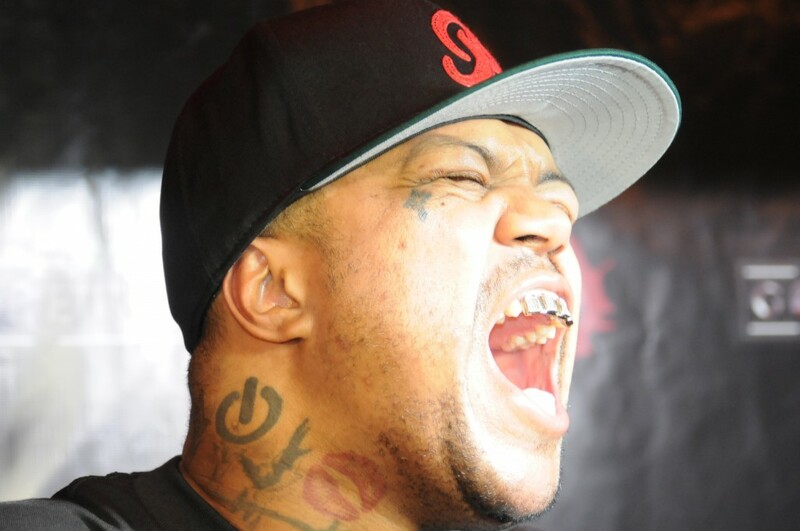 Then a mad man can be seen through the top of the elevator telling guest that they are going to die, how cursed they will be and how we will go to hell. He then cuts the line supporting the elevator and the elevator begins to fall, each floor can be seen moving upward through the window/shadow effect and the entire room is shaking violently creating a really spectacular effect. You then crash at the bottom and the door opens. You begin your tour through The Delmont hotel. From that point on it becomes more of a traditional walk through maze with some rather impressive interactive elements and scares. For example, in a kitchen scene, a demon-chef asked me if I was hungry. I said “hell yeah”, and he then grabs a girl and places her face on the stove. Sizzling sounds are heard and her face is lifted off the grill and is now burned up. Goretorium does a lot of interactive gags similar to that throughout the maze which really separates it from being just another high-end walk through attraction. The scenes are very chaotic which I personally like, and the talent really worked it. Hopefully they can keep this level of energy up for years to come. Throughout the attraction you see some pretty wild stuff including live dismemberment, people going through meat grinders, cannibalism, torture, zombies, and lots of death. Which is fun. Overall Goretorium sets a new standard of haunted attraction that could only come from the disgustedly delightful mind of Eli Roth. There did not seem to be a dull part of the maze, however the ending (which I will not spoil) did come as a surprise to many people. It was fun, just very unexpected. My only real complaint is that the maze does get difficult to navigate at some points with no indication of where to go, with the combination of service corridors made for talent, I found myself going in the wrong direction (since I was leading the group) at least twice. Some themed signs could really help this attraction and make it absolutely perfect. The running time of the maze can vary from about 7 minutes to 12 minutes depending on how fast you walk through. But in an attraction with as much detail and love put into it, it’s worth staying in the back of the line to enjoy the stunning sets and awesome practical effects. While the haunt season is just about to get roaring into full swing, if you can’t make it out just yet, don’t worry. Goretorium will be open year round, and will offer different changes depending on the seasons, and may eventually coincide with different horror movie premieres. Once outside the Delmont, if you survive, you can hang out in the ultra cool Babydolls. 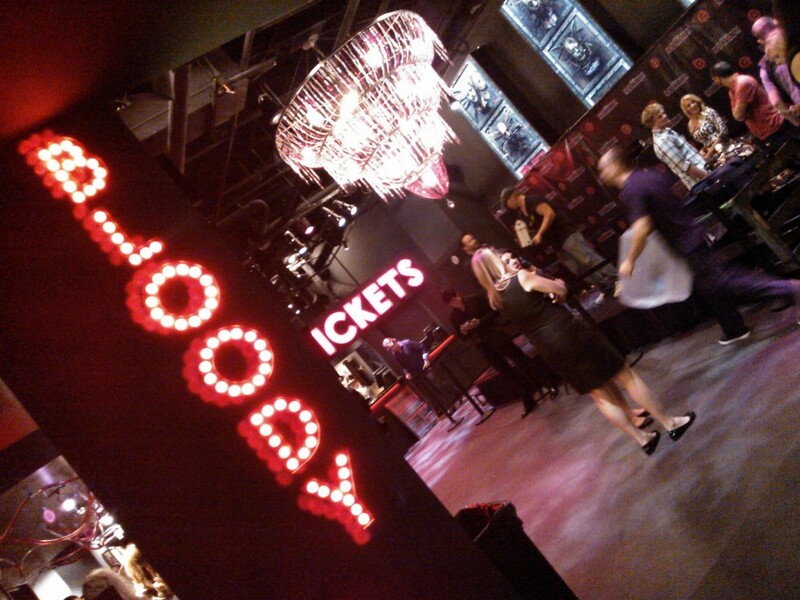 It’s a nightclub like no other, with zombie go go dancers that are fed live food once an hour. We’d like to tell you more, or even show you more, but we were asked to leave within minutes of arriving due to a VIP function that was closed to us and others. Goretorium is a brand new experience, so before you go, here’s a few things to know to make the experience more fun, and get the most out of your trip to the Delmont. Hours of operation-The hours for the haunt (they are listed on the website, but only briefly) are Wednesday through Sunday from 7p.m. to 2a.m. The hours for Babydolls lounge are 8p.m. to 2a.m. Buy your tickets online-Just as at any theme park, tickets are best purchased online. 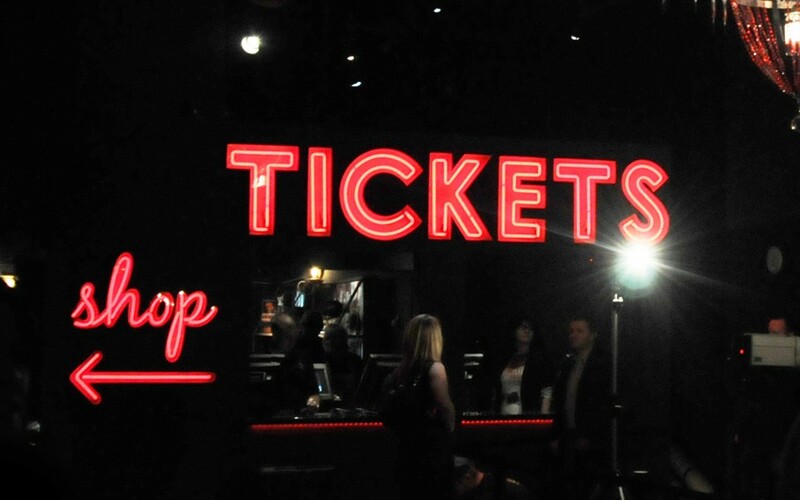 You’ll avoid long lines at the box office, and be able to make it through faster. 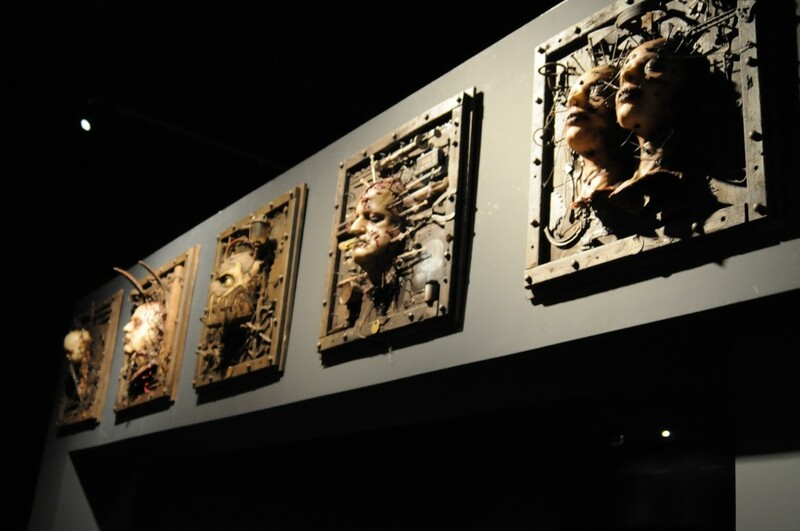 Get there early-Just as at any theme park, you’ll want to be at Goretorium before the gates open. You might also want to squeeze in a last minute run, but with the first few weeks of operation, leading up to Halloween, you’ll most likely want to do it early. 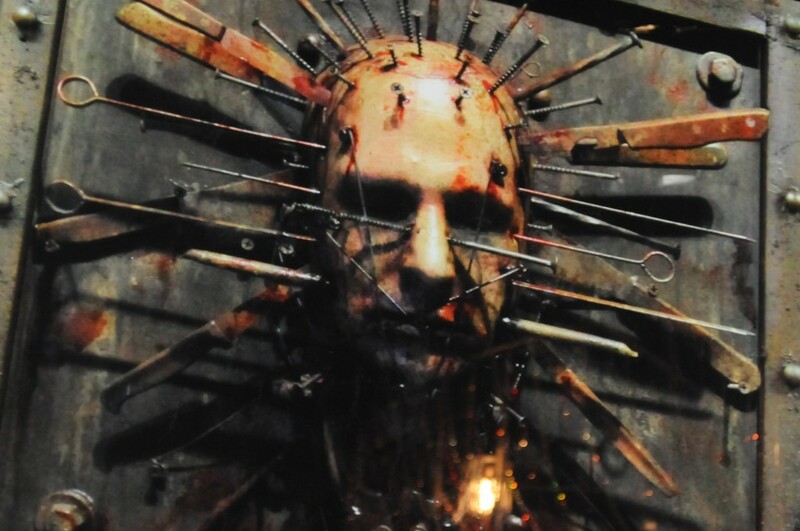 For more information about Goretorium, including tickets, visit the official website.